The aggregate impact value gives a relative measure of the resistance of an aggregate to sudden shock or impact, which in some aggregates differs from its resistance to a slow compressive load. The test sample shall consist of aggregate the whole of which passes a 12.5 mm IS Sieve and is retained on a 10 mm IS Sieve. The aggregate comprising the test sample shall be dried in an oven for a period of four hours at a temperature of 100 to 110°C and cooled. The measure shall be filled about one-third full with the aggregate and tamped with 25 strokes of the rounded end of the tamping rod. Further similar quantity of aggregate shall be added and a further tamping of 25 strokes given. The measure shall finally be filled to overflowing, tamped 25 times and the surplus aggregate struck off, using the tamping rod as a straight edge. The net weight of aggregate in the measure shall be determined to the nearest gram (Weight A). The impact machine shall rest without wedging or packing upon the level plate, block or floor, so that it is rigid and the hammer guide columns are vertical. 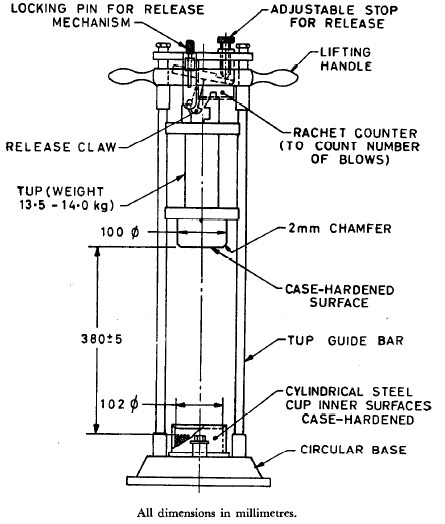 The cup shall be fixed firmly in position on the base of the machine and the whole of the test sample placed in it and compacted by a single tamping of 25 strokes of the tamping rod. The hammer shall be raised until its lower face is 380 mm above the upper surface of the aggregate in the cup, and allowed to fall freely on to the aggregate. The test sample shall be subjected to a total of 15 such blows each being delivered at an interval of not less than one second. The crushed aggregate shall then be removed from the cup and the whole of it sieved on the 2.36 mm IS Sieve until no further significant amount passes in one minute. 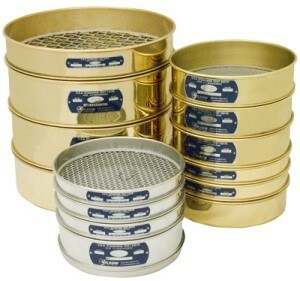 The fraction passing the sieve shall be weighed to an accuracy of 0.1 g (Weight. B). 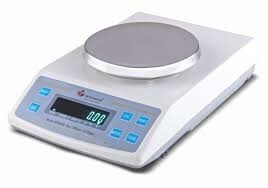 The fraction retained on the sieve shall also be weighed (Weight C) and, if the total weight (C+B) is less than the initial weight (Weight A) by more than one gram, the result shall be discarded and a fresh test made. Two tests shall be made.